JOIN US EACH DAY, OCT. 27-30 FOR SOME CHILD-LIKE FUN. WE'LL HAVE TUTORIALS AND DT INSPIRATION. THERE WILL BE PRIZES FOR LEAVING COMMENTS ON THE DESIGN TEAM'S BLOGS AND PRIZES FOR TRYING OUR TUTORIALS. YOU WILL HAVE 2 WEEKS TO ADD YOUR PROJECT TO THE OCT. 30TH POST FOR US TO SEE SO THERE IS NO EXCUSE NOT TO JOIN IN THE FUN. 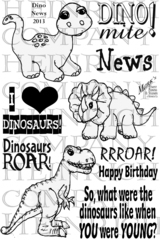 You could win one of the MFP Stamp Shop Child-related stamp sets. Just comment on the DT members' blogs (don't forget this one) each day for more chances to win! (You do NOT need to comment on on all the blogs each day! The names are drawn randomly.) Try one of the tutorials shown during the Hop and add your photo to the Inlinkz at the bottom of the MFP Blog post. 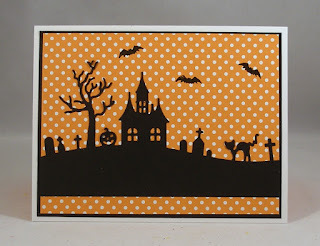 The winners will be announced on Nov. 14, 2015 on the MFP Stamp Shop Blog. You can go back and comment if you missed a day. (HINT: The more you comment the more chances you have to win. And comments on the MFP blog count twice.) The deadline for commenting and posting pics of your projects is Friday, Nov. 13, 2015, at 10:00 PM EST. 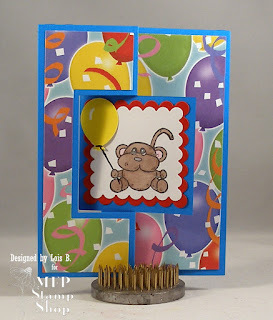 It's Friday already, last day of the blog hop. Susie is growing up; she's about 12 years old and has discovered that she likes horses. Today's card is a double gatefold card. From the front it looks like a standard gatefold card. But when you open it up, you can see the extra panels. 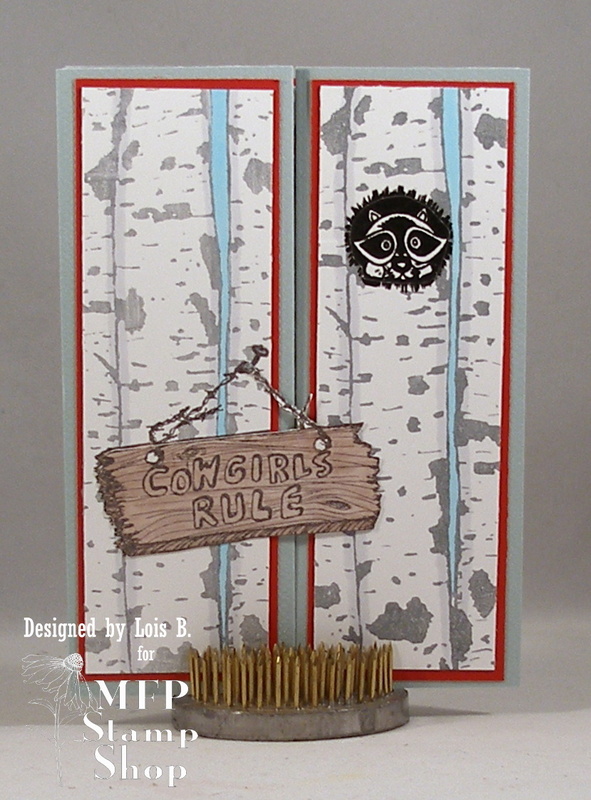 I used two different stamp sets on today's card: News from the Woods and Cowgirls Rule. on Nov. 14, 2015 to see if you are a winner. Susie is starting school today. I thought this card could be tucked into her lunch box for some friendly support on her first day. I used another Sizzix die to make the base of my card. 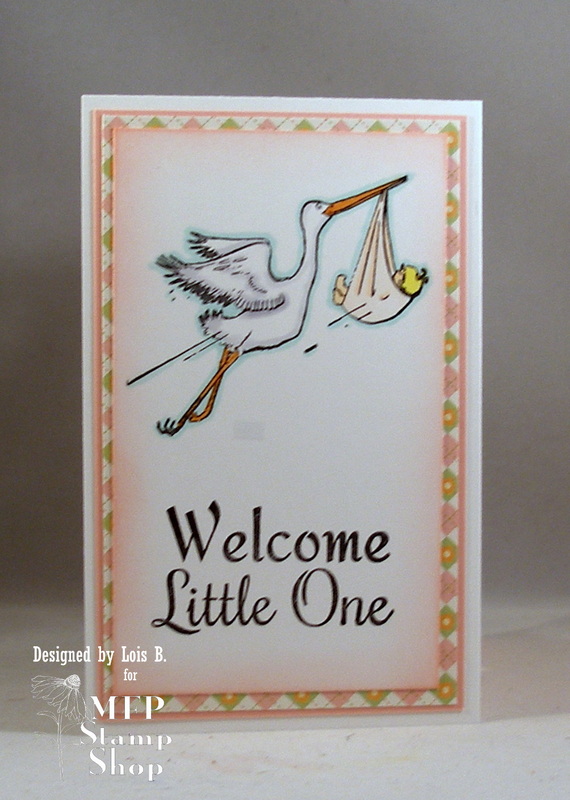 The stamp set I used on today's card is Lesson Learned. 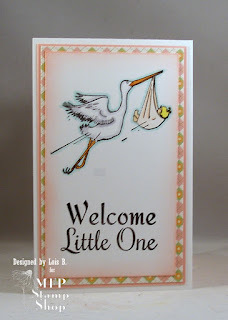 Maryann had an extra week as hostess for the CCEE Stampers blog this month. She asked the team members to create a card with something down under. It could be under the sea or a tree or underground, under an umbrella, or even (to honor her country) from down under in the world. 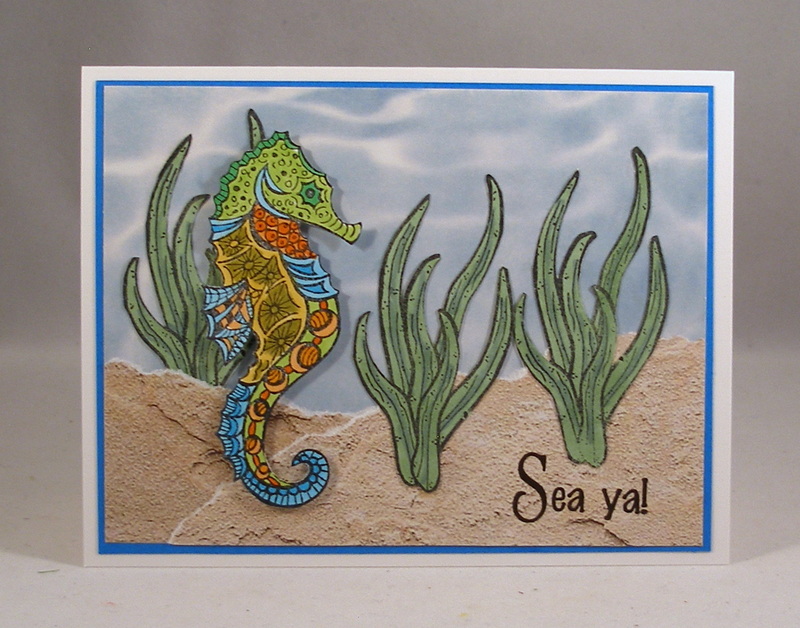 I chose under the sea so that I could use a new stamp I recently purchased -- the Zentangled seahorse. 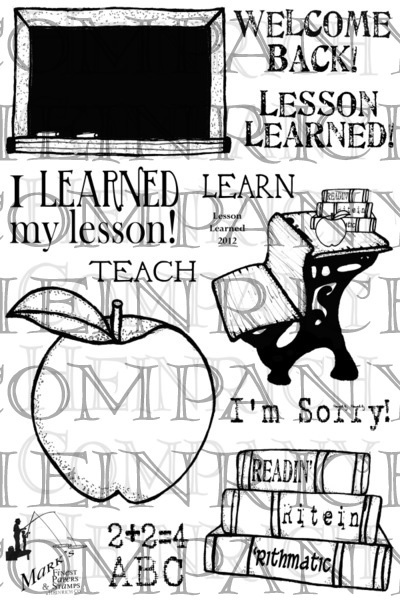 Check out the CCEE Stampers blog to see which "under" the rest of the team members chose. Susie was announced to the world yesterday. 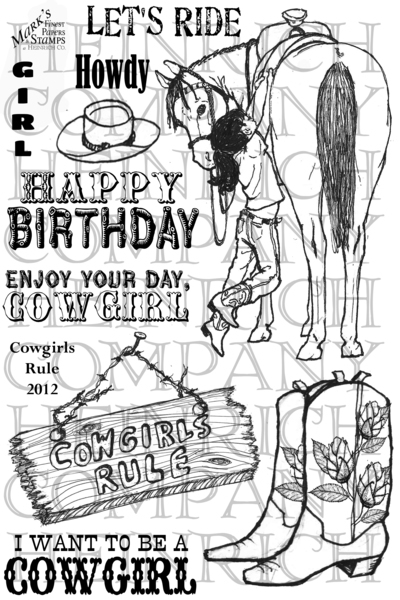 Today she is celebrating a birthday -- maybe her second or third birthday -- so I have a birthday card for her. 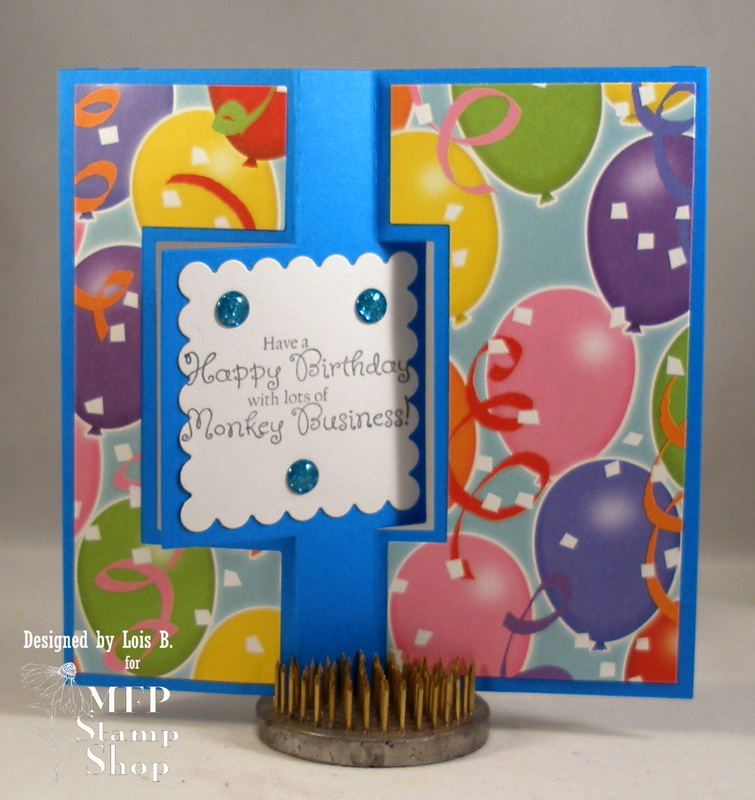 It's another fancy fold card, although I used a Sizzix Flip-It die to cut it out. 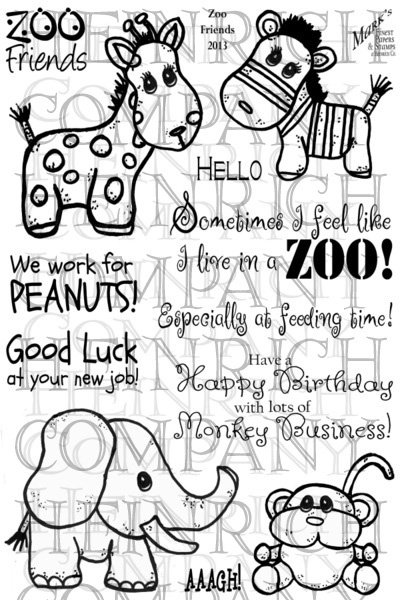 The stamp set I used for this card was Zoo Friends. As the theme of the Blog Hop is "It's All about the Kids," I've decided to relate a little story about one particular kid during the week. Her name is Susie! Today's card announces Susie to the world. If you've followed my blog at all, you know I love to make fun-fold cards. Today's card is a Building Block Card. As you can see, when you open the card, the "blocks" pop out of the valley fold inside. 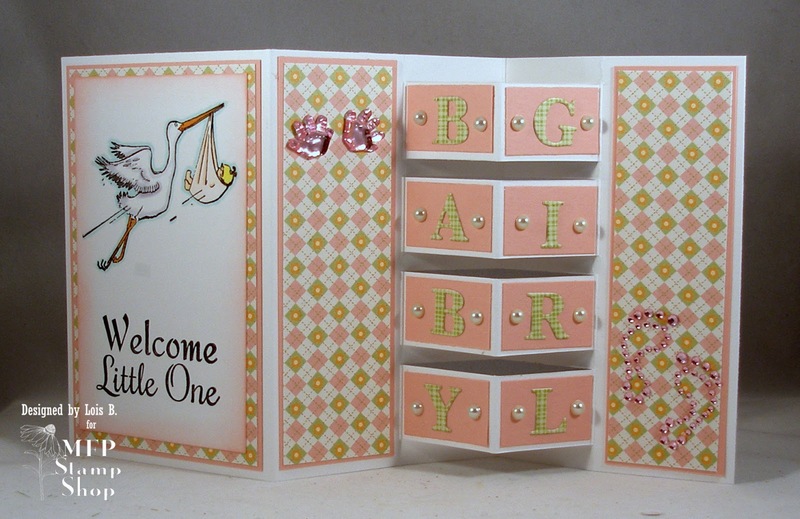 I added a little bling to the inside -- baby hands and feet. 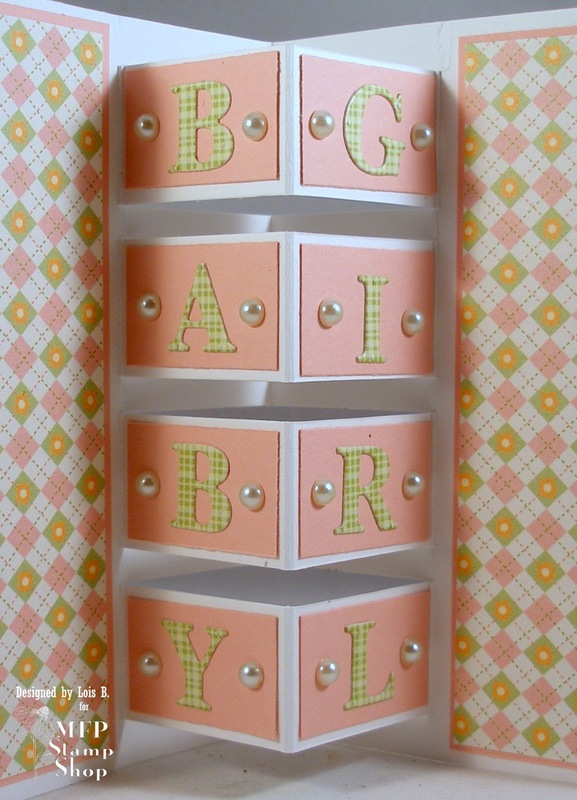 Here is a close-up of the blocks (prior to my adding the bling). 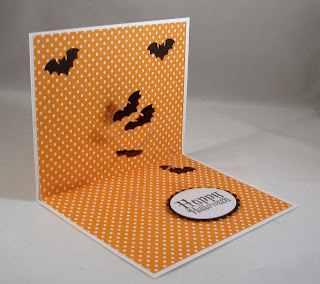 A little hint: To make adhering small die-cut pieces easier, put some double-sided adhesive (either a sheet or strips) on the back of the card stock before you cut them out. That way you don't have to try to add glue after the pieces are cut. For this card I used MFP Stamp Shop set Bundle of Joy. on Nov. 14, 2015, to see if you are a winner. Maryann continues as hostess for the CCEE Stampers blog again this week with a challenge to create something with reflections. It could be in a mirror or on water or a verse that looks into the past. I chose "water" for my reflection. I stamped the image on waxed paper to get the reflection. 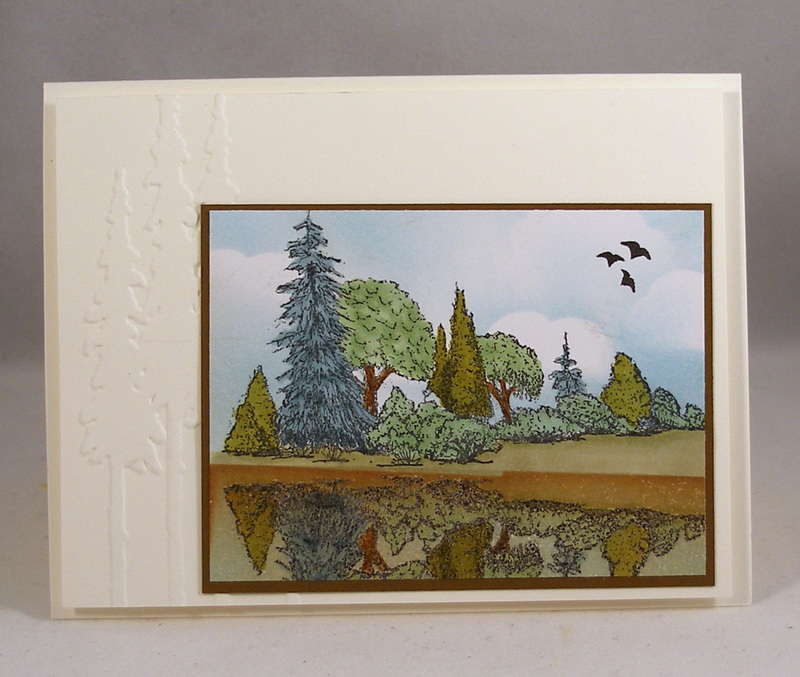 After I colored the "real" trees and the "reflected" trees, I masked the top and sponged some Tim Holtz Salty Ocean and Vintage Photo ink on the part of the picture that was "in the water." 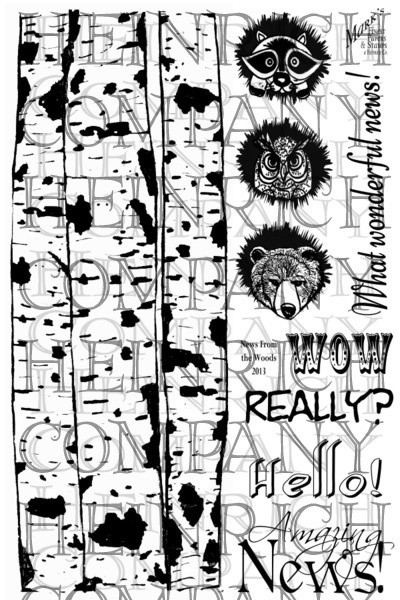 Check out the CCEE Stampers blog for more reflections. 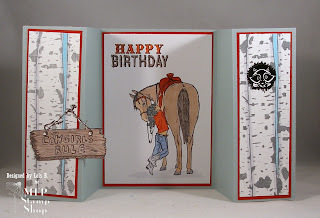 Maryann continues as hostess for the CCEE Stampers again this week. She asked us to use some acetate on our cards this week. Back in August, I had seen a card that Sabrina had made using an acetate spiral. I stuck it in my Favorites on Splitcoaststampers because I knew I wanted to CASE it. 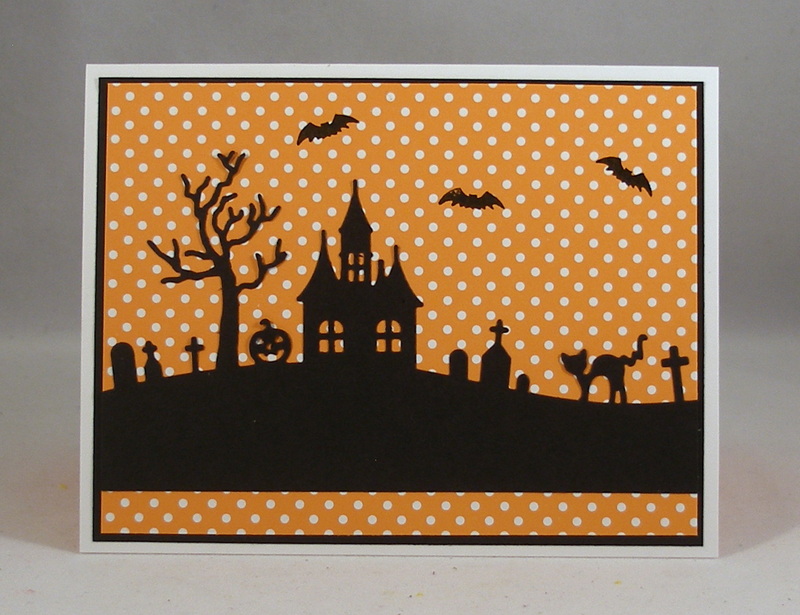 You can't see the acetate on the front of my card (because it isn't there!). It's on the inside. 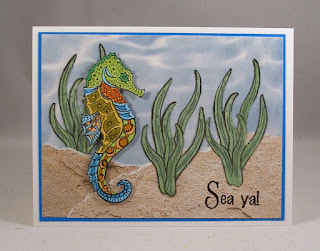 You make a spiral out an acetate circle and add cut-out or punched out embellishments on the spiral. It looks like the bats of floating in mid-air! How cool is that!!! Maryann continues as hostess for the CCEE Stampers this week. We couldn't be female without some chocolate in our lives. 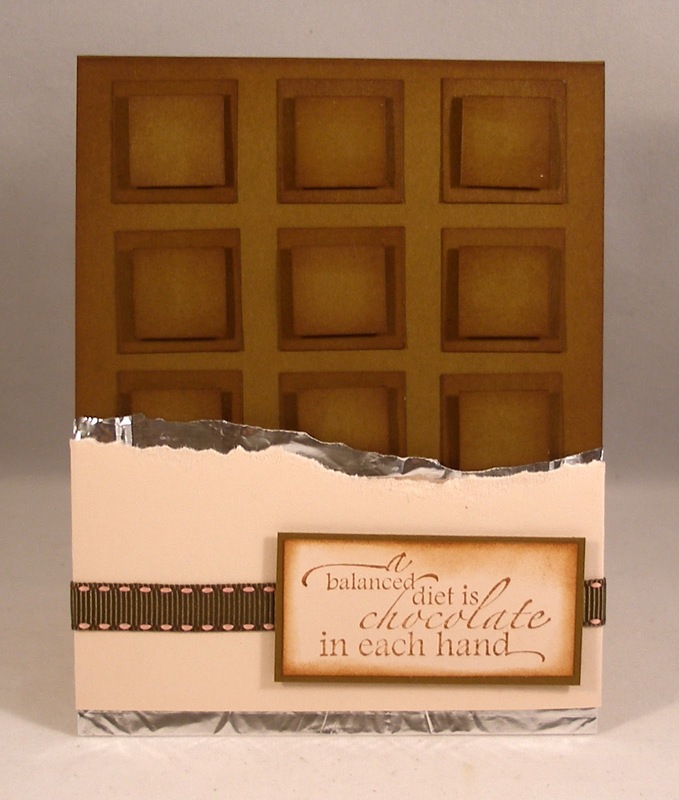 Maryann asked us to make a card using a chocolate combination -- chocolate and pink, chocolate and green, chocolate and vanilla. I chose Chocolate and Pink to make my Chocolate Bar card, the directions for which I found on a Technique Junkies CD. Check out the CCEE Stampers blog to see some more chocolate creations. 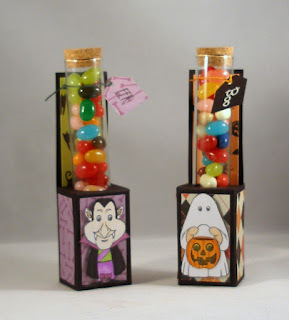 The October challenge on the Scor-Pal Blog is Treat Holders. 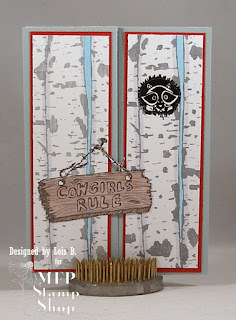 I scoured the internet and found a tutorial for some cute Test Tube Treat Holders on Splitcoaststampers. Here is a link to the tutorial. 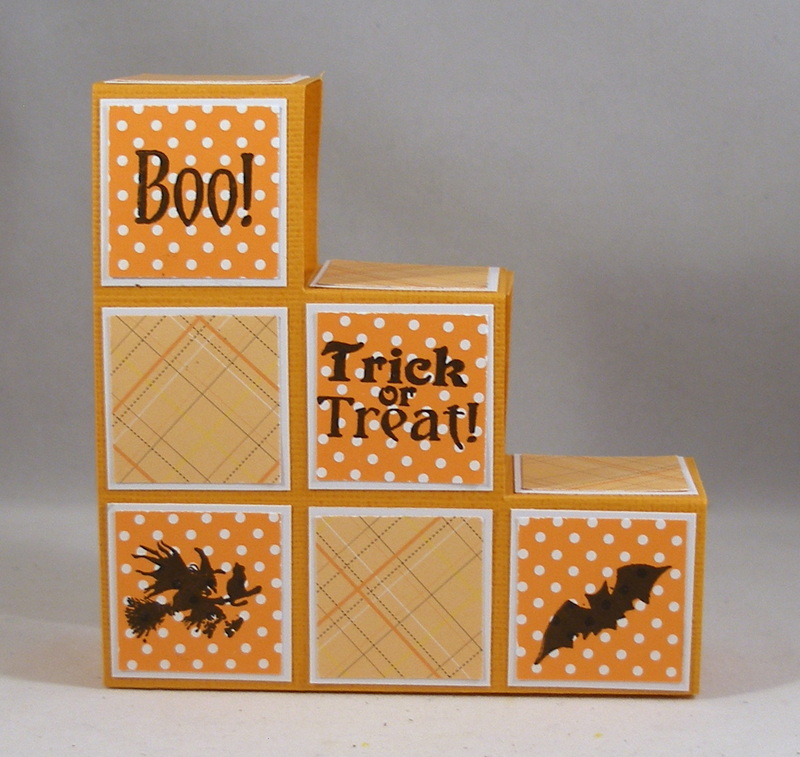 Using some delightful Halloween designer paper and cute "not-so-scary" images, I created these two treat holders. I found the test tubes at Michaels in their bargain bins. I have to admit that, even at 74 years of age, I still love jelly beans. 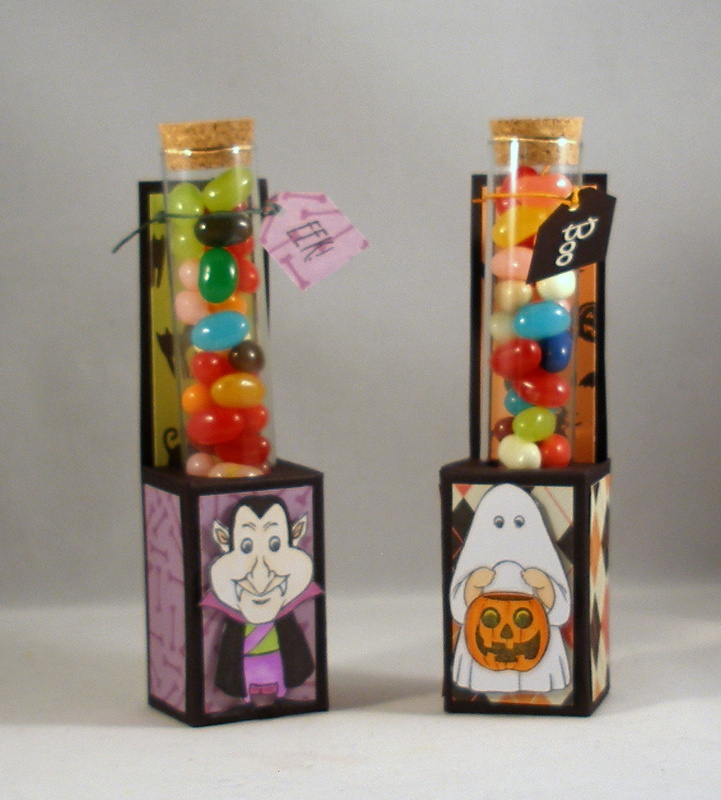 Jelly Bellies are just the right size to fit in the test tubes. 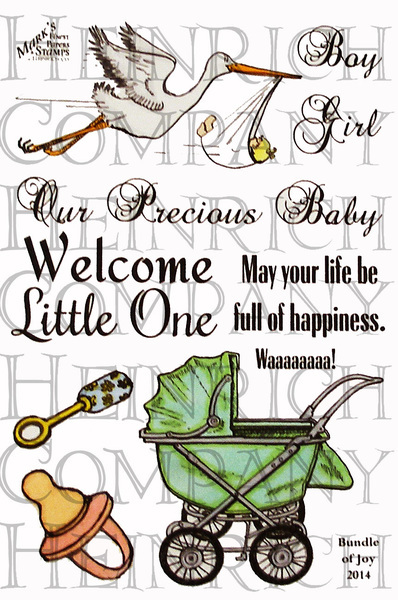 Maryann Einam is the new hostess for the CCEE Stampers for the month of October. She said she has been wanting to try to make a Block Card (made to look like a child's building blocks. Here is the tutorial I used to make my card. 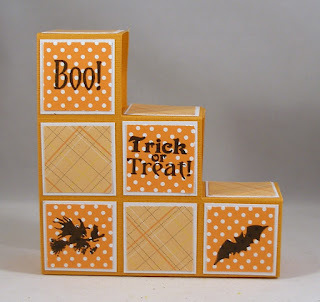 Check out the CCEE Stampers blog to see some more cute building blocks.